This is a test kit which contains a single one ounce container for each of the colors in the Wildfire Visible Colors lineup. Great for small scale mock-ups or just to experiment with colors. 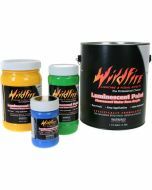 Wildfire Visible Luminescent Paints appear bright under ordinary light and fluoresce brilliantly under black light thanks to their supersaturation of UV sensitive pigments. They can be mixed with each other for more color variation, or mixed with non-fluorescent water-based artist acrylics for more subtle fluorescent shades. 1.85" x 8.94" x 6.9"